How To: Start Blogging After A Break! Last updated on December 30, 2016 By Nat 4 Comments This post may contain affiliate links. We appreciate you supporting Rags To Niches! Full disclosure here. 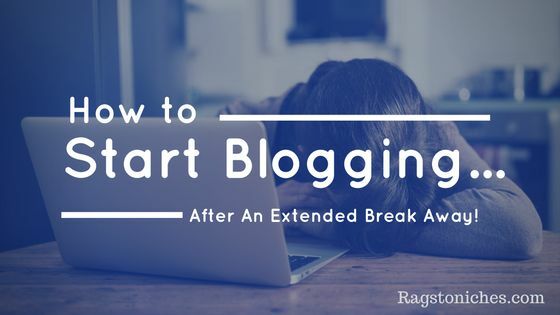 Have you ever needed to start blogging again after a break? Has a small few days off turned into weeks… or even months? Maybe you’re in that position right now. Well, my last post to this site may just have been… just over a month ago! I spent two weeks of that on an awesome family holiday. We stayed at Disneyworld Florida and at Universal Studios. I went away feeling as though it would be extremely difficult for me to take a break away from my websites. Two whole weeks away. I’d just recently been attempting a 30 post in 30 days challenge, I’d spent the previous month writing like crazy. But do you know what? It was surprisingly easy to let it all go. It was all too easy in fact, (sorry folks!) and really not so easy to return back. I suppose that’s because I literally seemed to be temporarily transported to another reality while away. It was a fantasy. The most stressful encounters facing me involved which fastpass to get, or where we’d eat for dinner – nothing intense to deal with, aside from adrenaline on rides. …And for someone who usually works out 5/6 times per week, including 3 runs, I did next to no exercise aside from walking around theme parks…and I ate A LOT. So, after having a couple of weeks living quite another sort of life, I have to admit – I really struggled to return to my usual mindset. It felt like I have a zillion things to do suddenly. It felt as though I’d fallen behind in every area of my life and I panicked. All this from just two weeks away from reality?! I got back feeling that every little mundane task was my own personal mountain to climb. Gratefully, I have been on this very, (practically identical) trip before and remembered all to clearly how coming back had been brutal. I also remember it took me two weeks to the day of returning to start feeling myself again. So, I clung on to this belief desperately – wanting very much to believe that I would definitely return to a happy and content reality after two weeks. Two weeks arrived and – in the last couple of days – I’ve managed to arrange all the content I’m creating for January; all my 2017 goals have been set and my motivation is bubbling away once more. I am ready to rock and roll!! But…. it was a bit worrying there for a while. This is clearly something I’m going to consider very carefully before taking an extended break again. Perhaps, even while away, it’s important to still keep one foot still in the door… to try and still stay in the loop somewhat! I also think it’s wise to prepare for a period of inactivity, by having a certain amount of content ready to be posted when you’re not up to the task, (yup – guest posts set up would be a good idea too!). Anyhow, this self-indulgent post is entirely apt as my first post returning – because I know I’m not alone in finding it hard to get to blogging after a break! There are tonnes of bloggers out there, desperately trying to clamber back up on to the blogging wagon…but just can’t seem to cling on. Some may never return! So, what are some ways that we can get back to blogging after a break? Write a blog post about your struggle – (ta-da! See what I did there? I practice what I preach!). If you don’t feel quite ready to delve into the writing side, consider refreshing your old posts instead, (I did this too!). Update your theme, get some of those plugins you keep making notes to look at, have a little tinker about and familiarize yourself with your blog, (which may feel like a little alien after some time away!). Brainstorm! If you’ve had an extended break, some of your old content ideas may feel stale and uninspiring. So, look over some of your favourite relevant blogs and websites for inspiration for content and go crazy writing a tonne of ideas that could set you up for the next month or more. I can guarantee you, you’ll feel more motivated after taking this step! Realise that this extended break could potentially have been avoided and make steps to ensure it won’t happen for quite so long next time, (for example, start writing extra posts for those times you want a break, or set up guest posts). Schedule, schedule, schedule…. create a plan for the next month or three – for the next year if you’re feeling ambitious. Organise your time so that you’ll be able to fit in all the tasks you need to do and cut out relentless time wasting activities, (e.g. checking email and Facebook a thousand times per day is a NO!). There is only ONE of you… if the tasks you have to do just seem too many, you need to do one of two things: forget about everything apart from the MOST important tasks and work from there, OR – outsource and get some help! Ultimately, I have found that by having a plan of action for the forthcoming weeks, it takes away all the uncertainty and anxiety about what needs to be done. By writing a detailed plan of action, it will help you feel confident – rather than overwhelmed by too many things you think need to be done. You will be able to have a clear picture of what you need to do. What I’ve learnt from this experience is just how easy it is to fall out of a routine. It can certainly happen to even the most disciplined of us. It’s good to take a break, but it’s probably a better idea to not let everything go altogether, or you may just find yourself struggling to regain the routine you’d worked so hard to accomplish in the first place. So, how about you? Have you found it hard to start blogging after a break?…. What helped you? Thanks for sharing this!! This is soooooo me right now! The holidays have certainly given me reason not to pay close attention to my blogging. I love your idea of going back and renewing an old post. I am also eyeing changing my theme. Cool topic, I can totally relate to this! Sometimes my break from my blog would take 2 or 3 months and man, its definitely a challenge trying to write again. You’re totally right that some bloggers might never return after a break because adjusting our lives just to write is not easy. The procrastination is real, I’ve been trying to write a 1,000 article and its taking me a week! Just so you know, writing this many words would usually take me an hour while I was hot on blogging back then. For me, the thing that works well when I try to get back into the game is to set goals to start writing small and continue finishing my article before the day ends and reward myself if I did. That way, supposing I couldn’t finish it on time, I’ll try and continue writing the next day filled with regret lol. haha I know what you mean. For me the hardest thing is starting – once I get writing it starts to take shape and I know what to do. Giving yourself rewards is a really good idea. I think it’s important to get started when you intend to… sometimes I struggle to start and the initial 5 minutes to check emails turns into two hours of who-knows-what wasted time. The stricter I am with a routine, the better. Thanks for the comment! !